Hello! I thought it wouldn't hurt to ask here because I know several people on the forum have serious art training. Today I found a silk screen on canvas by an artist that I'm very fond of. I bought it for just under $3 at a thrift shop. The print is by Marushka (not particularily valuable but I sure do love it) and is grass silouhettes in brown on the natural canvas....it's a bit stained (the canvas is slightly discolored.) Is this something I can clean myself or should I not even attempt it? If I can do it, how do I? Bread! Irishrose's article suggests using bread! Hah! That's great. And affordable, too. I don't live very far from Lake Michigan and the subject matter of Marushka prints is often of Lake Michigan and the sand dunes. The first one that I found (also from a thrift store) tree sillouhette. Today's find compliments it very well. Both of mine have a distinct 1970's decor feel.....and, if I understand right, date from early in the company's history. It's the simple plant-type subjects from the early days that I like. Nothing profound; just fun. The later ones that I see from the 1980's have sort of a "canned" feeling to them and it seems obvious from looking at them that they were produced for a specific market. Last edited by foxytocin; 09-25-2009 at 02:50 PM. And maybe if you contact the Michigan Rag company they can tell you more about how to clean a silk screen print on canvas. I'm sure they have a lot of knowledge about silk screening! What a great website of prints... gorgeous! Well, yesterday I gave them a call. Very friendly people. Turns out that back in the early 1970's, the artists were using a water-based ink that probably isn't even legal anymore. Anyway, the discoloring that I see is probably compounds from the ink leaching into the linen fabric. The only option to prevent this would be to set the ink in a large, hot oven which isn't an option because the print is too large for any oven I have access to. I do have access to a few kilns, but the only large one is a wood-burning one and somehow I don't think that would work. Hah! Anyway, I did try out the bread technique and by golly, it worked pretty well on the unpainted surface. On the inked area, however, the bread wanted to lift the ink a bit. I like your print that you found very much. I also love the fact that I learn something new almost every day. 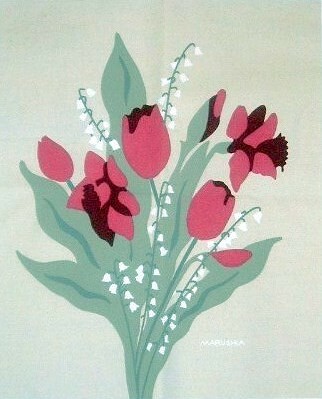 Wonderful synopsis of the Marushka prints. I would also add that you could easily do this with your flower pictures. screens to make screen prints? It is just a matter of turning them into separate screens for each color you want to use in your posters. Make some money yeah.... I think your prints would be far lovelier. And to me, more collectible. I like this one a lot on the Flickr. Last edited by screenpainter; 09-27-2009 at 10:01 AM.